Less than a quarter of a century after its first intervention against Germany, the United States once more was engaged in large-scale combat operations against Germany. This time, too, Germany was considered an enemy and, as in the first world war, the U.S. sought not only the expulsion of Germany from the territories it had occupied but a complete recasting of the German political system. However, unlike in 1918, the U.S. was eventually able to harness its combat activities and those of its co-belligerents in the pursuit of the second, and not only the first, goal. 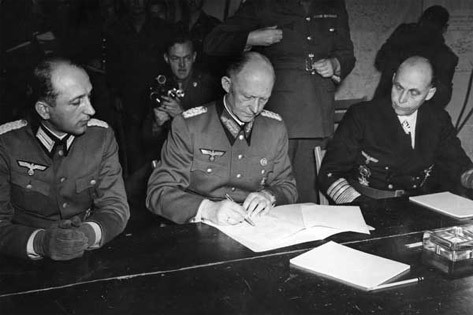 This process took several years, although U.S. antipathy toward Germany was evident well before any formal declaration of war or, for that matter, of World War II itself. The veiled references in Roosevelt's “quarantine” speech of October 1937 were made much explicit a year later when, at the time of the Munich Accord in 1938, Roosevelt spoke of “German aggression” and explored ways by which the U.S. would be able to export arms to Britain and France in the event of a war. Germany's foreign policy, in turn, was seen as stemming from the dictatorial and internally violent nature of its regime, which was also abhorrent even then to the majority of U.S. policy makers. For example, Roosevelt denounced the anti-Jewish violence of Kristallnacht in November 1938 (barely two months after Munich) as having “deeply shocked” public opinion, adding that he “could scarcely believe that such things could occur in a twentieth-century civilization.” That day, as a response, the U.S. recalled its ambassador to Germany and, not coincidentally, announced that it was working to defend the Western Hemisphere against possible sources of aggression. At this point in time, U.S. means for countering Germany were every bit as limited as Wilson's had been in 1915. The U.S. was not at war and public opinion, though anti-German, was nowhere near ready to envisage open hostilities. Roosevelt pushed Congress to increase military spending and, when war broke out in Europe, moved in the direction of repealing what his future secretary of war called the “foolish and dangerous” arms embargo against belligerents. Both of these policy instruments – rearmament and arms transfers – were scaled up over the next two years. The U.S. embarked on a rapid military buildup, reinstating conscription for good measure. It also escalated its arms shipments: trading destroyers to Britain for naval bases and launching Lend-Lease as a way of transferring weapons without charge (first to Britain, then to the Soviet Union). To these instruments were added others: coordination of British and U.S. military planners, seizure of German assets, and the continued extension of a “Neutrality Zone” covering most of the North Atlantic, within which U.S. forces were authorized to attack German naval vessels. Thus, by the autumn of 1941, the U.S. was effectively intervening against Germany, although most of its actions were in support of others rather than in the form of direct combat. 1) Lindsay to Halifax, 20 September 1938, Documents on British Foreign Policy 1919-1939 , 3d ser., vol. 7: app. 4, doc. 5; “Roosevelt Condemns Nazi Outbreak” (similar language can be found in Welles, memorandum of conversation, 21 December 1938, FRUS 1938 , vol. 2: 451); “Stimson Attacks ‘Foolish' Embargo”; both New York Times , 16 November 1938, 6 October 1939; Hull to Kennedy, 11 September 1938, FRUS 1938 , vol. 1: 424; Roosevelt in meeting with Joint Chiefs of Staff, 7 January 1943, FRUS: Washington and Casablanca : 506, also 635n; Bohlen, “Memorandum of Marshal Stalin's Views as Expressed During the Evening of November 28, 1943,” FRUS: Cairo and Tehran : 513; “Eisenhower Regrets Policy of Total Surrender,” New York Times , 21 December 1964; Morgenthau to Roosevelt, “Suggested Post-Surrender Program for Germany,” 1 September 1944; Stimson to Roosevelt, 15 September 1944; both FRUS: Washington and Quebec : 87, 484; Stalin in meeting, 5 February 1945, Matthews Minutes, FRUS: Malta and Yalta : 626; also Langer and Gleason (1953: chs. 8-9); Iokibe (1981: 31-42); Reynolds (1981: pt. 2).